Check the USGS stream gage at Junction for current and historical flow conditions. This site offers approximately a quarter-mile of bank access along the South Llano River. The Bon Ton Roulet Cabins on the property are available to rent from the landowner. Please call (325) 446-3154 for availability. This access site is approximately 7.7 river miles upstream of South Llano State Park which is the put-in point for the South Llano River Paddling Trail. Float time from County Road 150 to the state park is approximately 3 to 5 hours depending on water level, flow rate, wind speed, and how well the fish are biting! Access is open from 30 minutes before sunrise to 30 minutes after sunset for angling from the bank and launching non-motorized boats, canoes, kayaks, or other floatable devices for the purpose of fishing. Vehicle and trailer parking by anglers shall be in designated areas only. Reservations to park on the property must be made in advance by calling (325) 446-3154. Head west towards Johnson City on US 290 approximately 60 miles and merge onto I-10 West. Go 17 miles and take exit 460 to merge onto TX-480 Loop West toward Junction. Follow directions from Junction below. Take I-10 West approximately 110 miles and take exit 460 to merge onto TX-480 Loop W toward Junction. Follow directions from Junction below. Head South on US 377 for approximately 10 miles and turn left onto County Road 150. In 0.2 mile the parking area will be on the right. Abundant angling opportunities exist in this segment of the South Llano River for Largemouth and Guadalupe Bass and Channel Catfish. 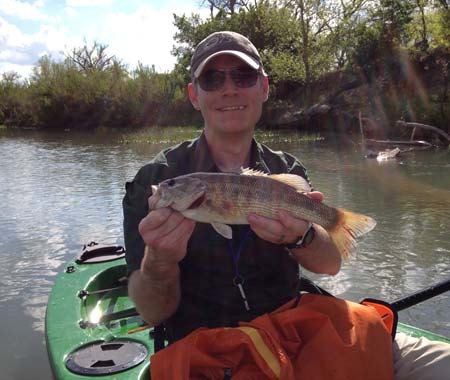 The South Llano River is part of an initiative to restore Guadalupe Bass populations. Fishing for black basses is best when turbidity in the river is low, as these species feed primarily by sight. Anglers should target faster riffle areas for Guadalupe Bass, and downed trees and aquatic vegetation in pool habitat for Largemouth Bass. Anglers are urged to practice catch-and-release of sportfish in this segment of the South Llano River, especially for Largemouth and Guadalupe Bass.